This Live Blog session closed at 18:54 on 15 Nov 2015. 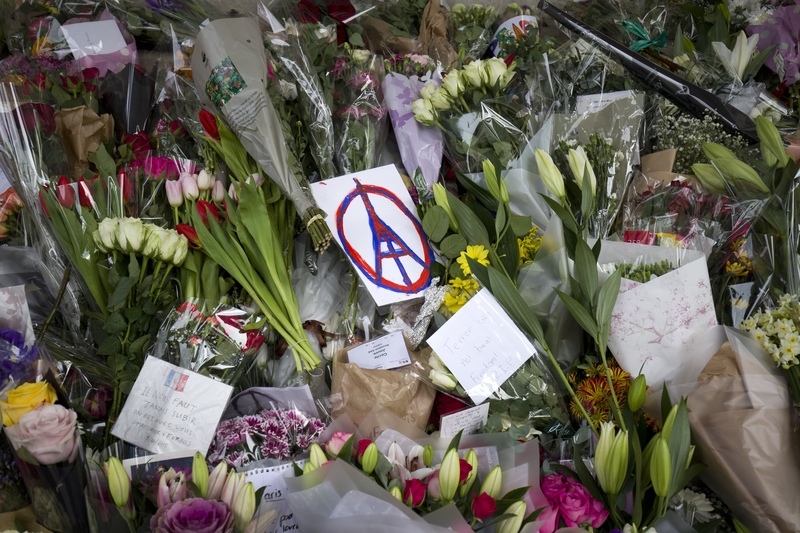 This live blog is now closed but for the latest coverage see: Paris attacks latest. Following the deadliest terrorist atrocity in a western city in more than a decade, security and border controls have been tightened across Europe. France is in a state of emergency, and security forces across the continent are scrambling to track down those involved in the plot, which French president François Hollande described as “an act of war” in a television address. Officials have named one of the attackers as Omar Ismail Mostefai, a 29-year-old French citizen of Algerian origin, who was apparently known to have links to Islamist radicals. The Paris prosecutor has said that Mostefai was flagged by the DGSI intelligence service as early as 2010 but was not thought to have any association with terrorists. According to one report, he went to Syria in the winter of 2013-14. Mostefai, a father of two according to French media reports, was a resident of Chartres until 2012. He had had several brushes with the law for minor offences and was convicted eight times but never sent to prison. Six people have been detained for questioning, including Mostefai’s father and one of his brothers, officials said on Sunday. France has begun three days of national mourning for the 129 victims of the attacks, in which another 352 people were injured. President François Hollande is due to address both chambers of parliament on Monday at 4pm local time. He also received his predecessor, Nicolas Sarkozy, at the Elysee Palace this morning. EU head Juncker has just said EU should not “give in to base reactions of rejecting refugees” after the Paris attacks because the shooters in France were criminals, not asylum seekers. Speaking on today’s Andrew Marr show, British Home Secretary Theresa May has said there is a “severe” threat from terrorists and urged people to be vigilant. Security arrangements in the UK are now set to be reviewed, she said. Nick Alexander, the first British fatality to be named, was “generous, funny and fiercely loyal”, his family said in a statement. It is with huge sorrow that we can confirm that our beloved Nick lost his life at the Bataclan last night. Nick was not just our brother, son and uncle, he was everyone’s best friend – generous, funny and fiercely loyal. Nick died doing the job he loved and we take great comfort in knowing how much he was cherished by his friends around the world. Thank you for your thoughts and respect for our family at this difficult time. Peace and light. Mr Alexander was selling merchandise for the rock band Eagles of Death Metal at the Bataclan venue. David Cameron, UK prime minister, has warned that Britain should “be prepared for a number of British casualties”. The attacks come at a very dangerous moment for Europe. Angst, confusion and disagreement over how to handle the unprecedented wave of refugees and migrants are coming to a boil. Economic growth remains anaemic in many parts of Europe and unemployment still high. The attacks may strengthen the hand of populist parties which have benefited from these trends just as key elections loom across Europe, starting with regional elections in France in three weeks’ time. More from the UK home secretary. Theresa May told BBC 1′s Andrew Marr Show that “British nationals have been caught up in this as well as French nationals. We stand absolutely shoulder to shoulder with the French in relation to this issue”. What we have seen from Daesh is that in the past there has been a focus on individuals conducting attacks, being encouraged to conduct attacks. [But] what we have seen from the attack in Paris was a co-ordinated attack, a planned attack on a larger scale. Ms May added that British police and emergency services had been training for an incident similar to the 2008 terrorist attack on Mumbai – multiple gunmen attacking numerous civilian targets. 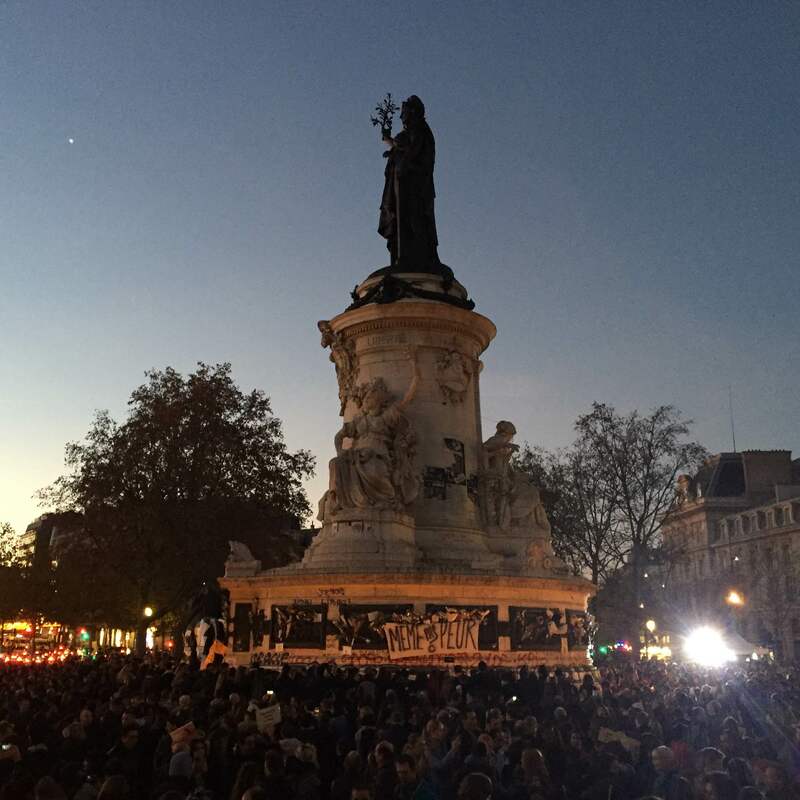 As a result of what has happened in Paris, we will now review that and see if there are any lessons to be learned. The news agency AFP, citing judicial sources, is reporting that three Kalashnikov assault rifles have been found in an abandoned car found on Sunday morning in the Paris suburb of Montreuil. The Seat car is thought to have been used by the attackers, though this has not been confirmed. Germany’s Foreign Ministry has said that one of its citizens was killed in Friday’s attacks but has not identified the individual. Former centre-right president Nicolas Sarkozy met socialist president Francois Hollande at the Elysee on Sunday. After a meeting that lasted more than 1 hour, the opposition party chief said he had demanded a shift in France’s military strategy in Syria, calling for a collaboration with Russia, which is also conducting bombings. We need everybody to exterminate Daesh (Isis), and notably the Russians,” Mr Sarkozy said. He also requested more action to tackle immigration: “There is no link, but the problem is there. We need to deal with the immigration wave from Syria at a European level. Mr Sarkozy also said he would outline proposals to toughen up security measures. 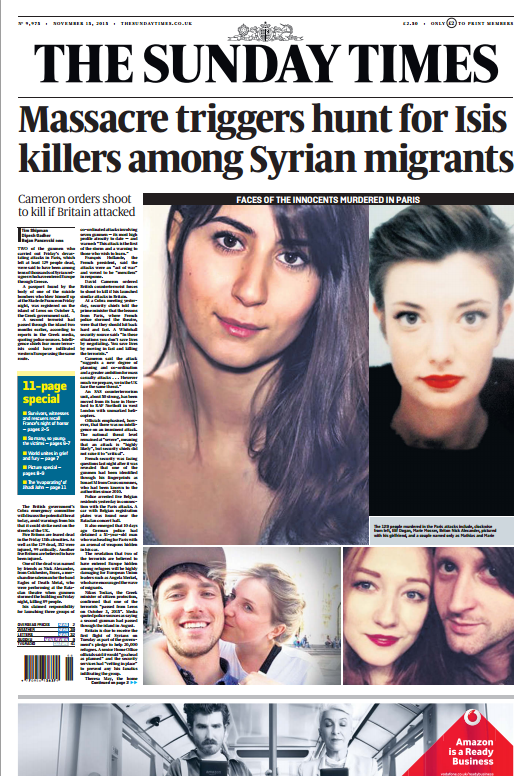 The German foreign office has said one of their nationals was amongst the dead in Paris. A spokesman for the Federal Foreign Office told the Financial Times they were not yet releasing any detail on the individual, or on whether he was killed at the concert, the stadium or a restaurant. World leaders are to step up efforts to choke off terrorist groups ability to raise money, recruit and move freely as the G20 attempts to show unity and purpose in the wake of Paris attacks that were “an affront to all humanity”. against terrorism, attempts to identify areas to bolster the decades-long international effort to tackle violent extremists groups, noting the particular challenges posed by groups like Islamic state. We are concerned over the acute and growing flow of foreign terrorist fighters and the threat it poses for all states, including countries of origin, transit and destination. We are resolved to address this threat. Leaders also promise to “swiftly” complete implementation of the Financial Action Task Force, which attempts to close of funding for groups such as Isis through the black market for oil or individual donations. and policy on extremist groups of the middle East. cooperation on tackling Isis and its international terrorist arm. US and Russia — which may only come if “more goodwill” is developed. Especially Russian actions on the ground in Syria must be focused more on Isis. We cannot accept any actions against the moderate Syrian opposition the only result will be the new wave of refugees..we have signals that it has started. Vladimir Putin, Russian president, has also been speaking today on the Paris attacks ahead of the G20 summit in Turkey. “We will only be able to deal with the terrorist threat … if all the international community unites its efforts,” he said. He will have been pleased at Mr Sarkozy’s reference to the Russians when he spoke of the need to “draw conclusions on the situation in Syria”. At least 129 people are dead after co-ordinated attacks on at least six sites; 352 injured, including 99 severely. Syrian passport belonging to an individual born in 1990 was found near one of them. French Prime Minister Manuel Valls has told reporters 103 of the 129 killed in Paris have been identified, according to French newspaper Le Monde. We will redouble our efforts working with other members of the coalition to bring about a peaceful transition in Syria and to eliminate Daesh as a force that can create so much pain and suffering for people in Paris and Ankara and other parts of the globe. There is more news coming in on the man arrested in Germany last week whose car was found to contain “very dangerous weapons” and who had a Paris address entered into his satnav. Le Figaro reports that he is refusing to talk to the police about the atrocities and says he was travelling to France to visit the Eiffel Tower. 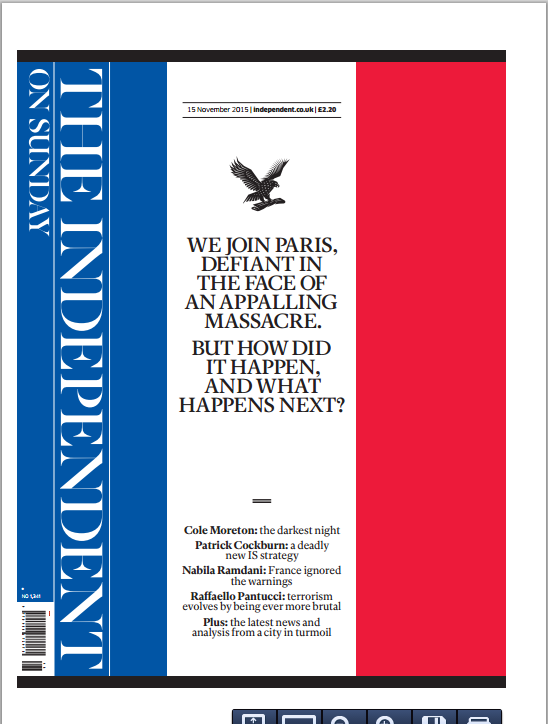 “We want to talk to him [about the Paris attacks] but he doesn’t want to talk,” a policeman told the newspaper. The suspect, a 51-year-old Montenegrin national, told police he had “no knowledge” of the arms and explosives found in his car. The FT’s Defence and Security Editor Sam Jones looks at whether the Paris killings will change counter terrorism officials’ assessments of Isis’ reach in Europe. There have been warnings for some time that the jihadi group was looking to mount some kind of mass-casualty attack, but many in the intelligence community were still sceptical about Isis’ capability to do so. As is now clear, the Paris attack involved three separate cells, well equipped with automatic weapons and bombs, kitted out in identical clothing and provided with cars for transport and travel. As the Belgian arrests indicate, there was clearly a cross-border element in the preparation and planning too. It is easy to gloss over, but assembling a team of eight individuals all prepared to die and work as a unit efficiently, without exposing themselves in the run-up to the attack, is a significant motivational and organisational feat. It means there is a deep, entrenched and covert network that put these individuals together. That will be very worrying. The task intelligence agencies will now be scrambling to accomplish is one that links the individuals in Paris to Isis figures in Iraq and Syria, and then to try and see what other links those figures may have developed back into Europe. The key question will be how a plot of this scale was not discovered by signals intelligence – I suspect we may discover the terrorists were using encrypted smartphone apps and were scrupulously careful with their operational security. The FT’s Gideon Rachman says the reaction of French voters in next month’s regional elections will be watched closely, notably support for the extreme right National Front. While the FT’s Philip Stephens argues that ending the Syrian civil war, and thus depriving Isis of its organising mission, requires an “ugly” political agreement. The #rechercheparis hashtag lists poignant photos of young men and women missing, some as young as teenagers. Authorities have identified 103 of the 129 fatalities, France’s prime minister said. Many of the injured have also not been identified. Ban Ki-moon, the UN secretary-general, says the response to the Paris attacks should be “robust, but always within the rule of law”. Speaking in Antalya at the G20 summit, Mr Ban said any response must respect human rights, “otherwise we will only fan the fire we are trying to put out”. He warned against taking action that would “only perpetuate the cycle of hatred and violence”. Suicide vests require a munitions specialist. To make a reliable and effective explosive is not something anyone can do. A munitions specialist is someone who is used to handling explosives, who knows how to make them, to arrange them in a way that the belt or vest is not so unwieldy that the person can’t move. And it must also not blow up by accident. The killing of innocent people, based on a twisted ideology, is an attack not just on France, not just on Turkey, but it’s an attack on the civilised world. EU interior ministers will hold an emergency meeting in Brussels on Friday to consider “follow-up” measures to the Paris attacks, according to the Luxembourg government, holder of the EU’s rotating presidency. The session, called by Luxembourg’s internal security minister Etienne Schneider in consultation with the French government, is intended to “strengthen the European response,” Luxembourg said in a statement. 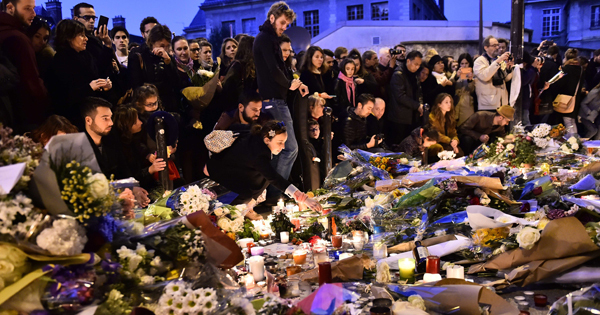 Confronted with terrorism and barbarism, Europe stands united with France. Lord Carlile, the Lib Dem peer who spent a decade as independent reviewer of terrorism legislation, has called for the timetable for giving police and security services new powers to intercept communications data to be “expedited” after the Paris attacks. Writing in the Daily Mail, he said that “now, more than ever” British security services should be equipped with “all the powers that they need”, adding this could be done “without any real risk to hallowed freedoms”. He called on the government to get its recently published draft Investigatory Powers Bill into law “as soon as possible” rather than by the end of 2016, as planned. The bill “gives our spies all the powers they need to fight terrorism” in the modern world. I am not arguing for blanket powers for the police and other security agencies to do what they like without oversight, but for speedy confirmation of powers that, responsibly, they have asked for and which they have demonstrated they need. However, the government appears unwilling to rush the legislative process. “We have a timetable, and I don’t think we will be rolling back from that,” a person at Home Office told the Guardian. Reuters reports that Belgian authorities have arrested five people during house searches in Brussels in connection with the deadly Paris attacks. There have been five arrests made linked to the attacks in Paris of Brussels where police carried out a series of raids on Saturday. The FT’s Laura Noonan reports that French Justice Minister Christiane Taubira has appealed for respect for the dignity of the dead and their families when handling photos of bodies. Isis militants are attacking their own countries because the journey to Syria has become harder – BBC . 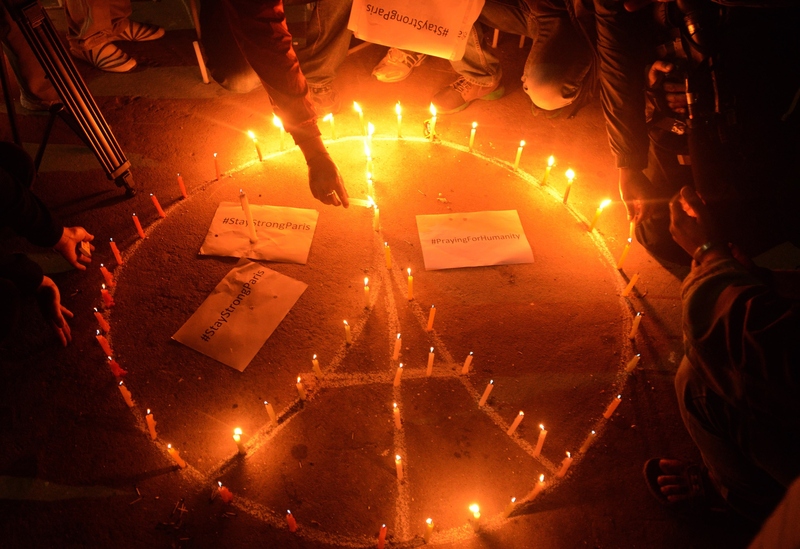 A more intensive war will strengthen Isis – OpenDemocracy. No, it won’t – Roger Cohen, New York Times. 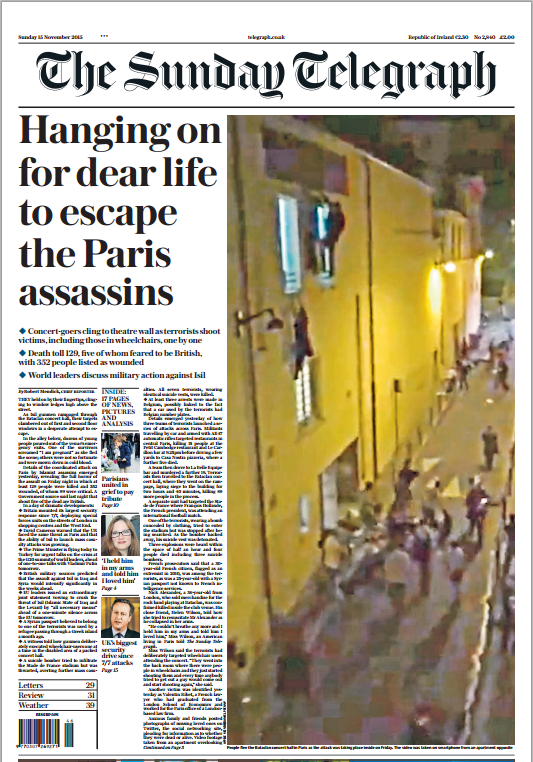 Paris needs more CCTV and security guards – Nabila Ramdani, Telegraph . 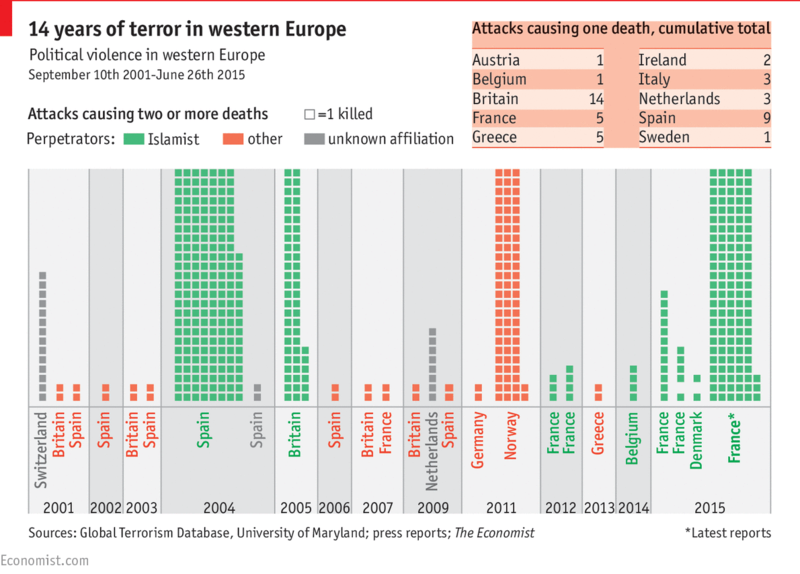 “One major concern must be the easy availability of automatic weapons in Europe.” – The Economist . European liberalism may be about to crack – Nick Cohen, Guardian . The head of the organising committee for Euro 2016 Jacques Lambert has said that cancelling the Euro 2016 finals in France would be “playing the game of the terrorists” and promises that it will take place securely. At the historic Ecole Militaire in the seventh arrondissement, across the road from the Eiffel Tower, a counselling centre has been set up for the victims and their families. Jerome, who was at the Bataclan theatre where the largest attack took place, visited on Sunday to receive counselling. Three of his friends escaped unscathed and two of them are in hospital. “These people are not terrorists, they’re murderers,” he says. “I’m lucky,” he adds. The man next to him in the concert hall was hit by a bullet in his hip. “A new type of war” is how the German president Joachim Gauck has described the attacks, says the FT’s Laura Noonan, drawing from German and French media reports. “We are living in an era where we cry for the victims of a new type of war,” Mr Gauck told his parliament, adding that the attack on France was also an attack on open society and a way of life. Mr Gauck is seen as a liberal, but implicitly criticised Angela Merkel’s stance on refugees in September. Two of the attackers were Frenchmen living in Brussels , and two vehicles used by the attackers were rented in Belgium, according to a Belgium prosecutor quoted by Agence France-Presse. Belgian authorities have arrested at least five people in relation to a car with Belgian number plates found near the scene in Paris. Associated Press is reporting a higher number – seven arrests. Police are still looking for one man, who rented the grey VW Polo found near Le Bataclan. A discarded parking ticket in the car was from the Brussels district of Molenbeek-Saint-Jean, where Belgian authorities have made arrests. - One suspect has been identified as Ismail Mostefai, a 29-year-old Frenchman, known to the authorities. Mostefai, one of the hostage-takers at Le Bataclan concert hall, was identified via a severed finger. Six of his relatives have been detained by authorities, including a brother who said that he had had no recent contact with Mostefai. Mostefai may have been in Syria in 2013 and 2014, according to Le Monde. - On Sunday French media also initially identified a 27-year-old Egyptian as one of the attackers at the Stade de France. However, the Egyptian ambassador said that the man, who died on the way to hospital, was a victim and not an attacker. - A black Seat, found in Paris containing 3 AK47s, is thought to be a getaway car used by attackers who escaped. A reporter from Liberation says the car contained 11 empty magazines and 5 full ones. We’re clearly going to work very closely with the French in terms of intelligence sharing, also in terms of their military response inside of Syria. The French have been with us in Iraq and Syria and conducting airstrikes. I think we want to continue to intensify that coordination. There’s a French three-star general who’s positioned in [US Central Command] to help facilitate that coordination. So we’ll be working with the French to go after ISIL in response. The president had a meeting yesterday that included the Secretary of Homeland Security, the director of the FBI. Our determination is there’s not a specific, credible threat to the homeland at this time. But we’re going to be very vigilant because we know ISIL has the aspirations to attack the United States as well as our European and other allies and partners. Thalys train attack, August 2015. Failed. Air Products factory attack, June 2015. Succeeded. 1 dead. Villejuif church attack, April 2015. Partially succeeded. 1 dead. Nice Jewish community centre attack, February 2015. Failed. 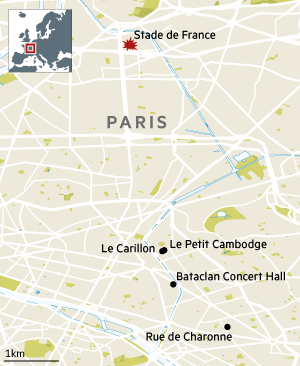 Charlie Hebdo and Ile-de-France attacks, January 2015. Succeeded. 20 dead. Sam’s full piece reviewing those attacks will be published on FT.com later. This was the moment that President Francois Hollande was told of the attacks, as he watched France play Germany at the Stade de France, according to Sky News. The three French brothers: as the French investigation focuses on the Paris attackers’ Belgian connections, Le Monde reports that the names of two brothers were found on rental contracts for the Volkswagen Polo found at Bataclan, and the Seat Leon discovered in Montreuil that contained Kalashnikov rifles. A third brother was among the seven individuals detained in Molenbeek yesterday. It is unknown whether the two brothers are the two French nationals living in Brussels whom a Belgian prosecutor said on Sunday were gunmen in the Paris attack, Le Monde adds. Adam Thomson, the FT’s Paris correspondent, has been investigating Omar Ismail Mostefai, the only of the suspects to be named by the police. 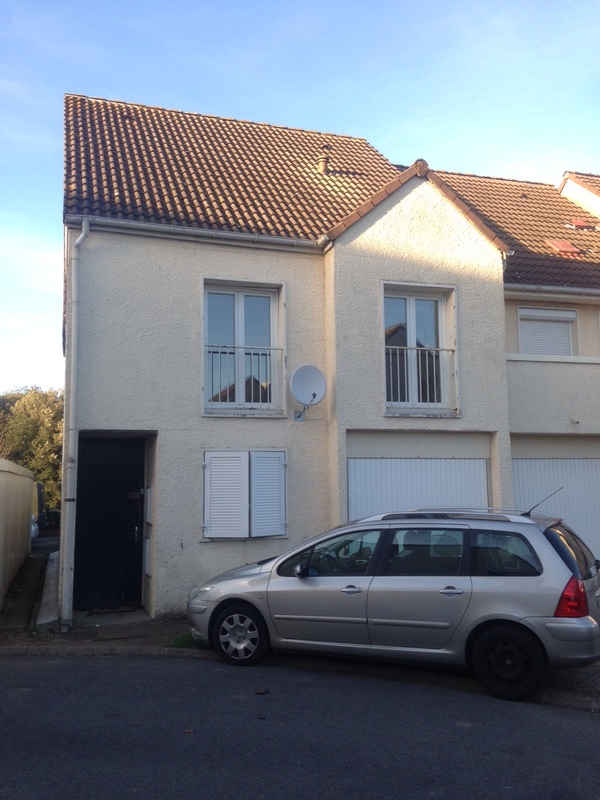 Here is where he lived in the district of La Madeleine, in Chartres until 2012. “Omar was a really great guy, friendly and open,” said a neighbour. This neighbour said that when he moved in the street, the suspect already lived there with his parents, sisters and brothers. He was friendly with the children, played football with the neighbours and wore normal clothes. Mustafei seemed to do odd jobs for a living. The mother wore a veil, but nothing out of the ordinary, the neighbour said. Marco Rubio, who has become the party’s top mainstream contender, and Jeb Bush, the man he has displaced, both said on Sunday that Nato should invoke Article 5. The article states that an attack on one member of the alliance is considered an attack on all and was used in response to the terrorist attacks of September 11, 2001. Nato said on Saturday that it had received no such request. John Kasich, the Ohio governor who is scoring low in the polls, also called for the use of Article 5, saying it would send a “very strong message”. But he told Fox News that mobilising Nato was not enough. “It’s also important that we include countries that are in the region,” he said, mentioning Saudi Arabia and Jordan as likely allies. “We should declare war and harness all of the power the US can bring to bear both diplomatic and military of course to be able to take out Isis, we have the capabilities of doing this, we just haven’t shown the will,” Mr Bush said. With much focus on the Syrian passport discovered on or near the body of one of the Paris attackers, an enlightening – and nearly year-old – piece by BuzzFeed’s Mike Giglio underlines the active trade in forging such documents along the Turkey-Syria border. Foreigners serious about entering Syria from Turkey — and especially about crossing back the other way — should use more sophisticated means, the human traffickers said. Among them was a better national ID card made either by corrupt regime officials or on commandeered equipment, which costs between $350 and $450. Most were made inside Syria, then smuggled into Turkey. The high-quality passports were obtained much the same way. A human trafficker working along the Turkey–Syria border, who gave the nickname Khaled, said he believed that ISIS relied on its own teams of forgers to secure such IDs. “They started making IDs for themselves, just to make it easier for them to travel in Turkey,” he said. Jean-Claude Juncker, European Commission president, on Sunday rebuked those attempting to use the attacks to change EU policy as populists who are improperly equating asylum-seekers with outlaws. Political leaders in Poland and Slovakia warned that the influx of migrants into Europe posed security risks, with the incoming rightwing government in Warsaw insisting it was no longer willing to accept refugees under a recently agreed EU policy to relocate some of the thousands of migrants arriving in Greece and Italy across the bloc. “Everyone must now assess how great a mistake is to try to settle a large Muslim immigrant community in Poland,” said Antoni Macierewicz, defence minister in the incoming Law and Justice party government. Robert Fico, Slovakian prime minister, said his government would redouble efforts to prevent radicalism in Slovak refugee camps, arguing “safety risks associated with migration are enormous”. AFP (via Le Figaro) reports one was killed in Friday’s attacks, and another has been detained in Belgium, although it is unknown whether he was tied to the assault. A third may also have been a suicide attacker or may have fled, AFP adds. Demetri Sevastopulo, the FT’s Washington Bureau Chief, has highlighted this piece (in Foreign Policy magazine) by James Stavridis, a retired US admiral and former Nato supreme allied commander. Le Figaro reports that the French president will ask legislators to approve extending the state of emergency he declared on Friday evening for three months. Under French law they must approve any extension of a state of emergency beyond 12 days. 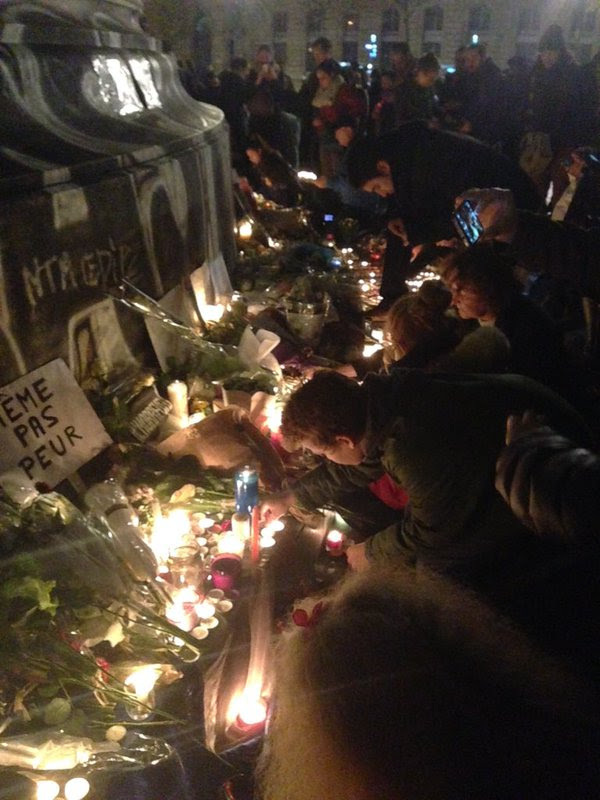 While security services focus on the hunt, Parisians gather to mourn the dead. Belgian police have issued an international arrest warrant for a possible eighth assailant involved in Friday’s terrorist attacks in Paris in which 129 people were killed. The man is believed to be one of three French brothers who were living in Belgium. One of the brothers died in the attacks while another was recorded crossing the border from France into Belgium on Saturday, though the authorities were not aware of his possible involvement at that time. A sign that Paris remains a jittery city this evening. Reports of shootings appear to have been a false alarm – but this Channel 4 News video records the moment panic broke out at the Place de la Republique memorial earlier. Prior to the panic the FT’s Jim Brunsden reports the atmosphere had been defiant. As marks of respect people left a growing canopy of candles at the foot of trees in the square and attached flowers to a monument in honour of the French revolution. In a sign of the year France has been having, the monument is still adorned with half peeled posters from the attack in January on Charlie Hebdo. With the attacks still raw in the public consciousness, some chose to wander round the square quietly contemplating what has struck their city. Others held up signs offering free hugs. “The investigation will show that the Paris attacks were prepared abroad, by a group of individuals based in Belgium who benefited from accomplices in France. The police and gendarmes find no more of his trace, neither in France nor in Belgium. An international arrest warrant has been issued. …Following the attacks, intelligence and law-enforcement agencies reviewed intercepted communications and concluded that the attackers had been in touch with members of the Islamic State in Syria, American and French officials said. Jeb Bush, the son and brother of former presidents who is waging his own faltering campaign for the White House, said Mr Obama’s “containment” policy was not going to work. “It’s a policy of … just running out the clock so the next president has to deal with this,” he told NBC television. Ben Rhodes, the US deputy national security adviser, was sent out to rebuff the criticism. He said Mr Obama was talking specifically about Isis’s geographical expansion in Iraq and Syria – not its international reach – when he said it was “contained”. He also stressed that “we very clearly understand” the threat from Isis and noted that the US this week launched an airstrike that it said killed the Kuwaiti-born Briton known as “Jihadi John”, who featured in Isis beheading videos. As the Paris attacks thrust the Middle East to the front of the 2016 presidential campaign, Washington is watching to see which candidates that hurts. Senator Bernie Sanders, who is challenging Hillary Clinton for the Democratic presidential nomination, got some bad reviews from pundits after saying in a Saturday debate that climate change was still the biggest national security threat facing the US. Among Republicans, foreign policy is not seen as a strong suit of Donald Trump and Ben Carson, the outsiders leading the Republican pack, while a hawkish tilt causes problems for Senator Rand Paul, a critic of military adventurism. Senator Marco Rubio has sought to cast himself as a foreign policy expert and aimed to boost his credentials, arguing that the US should use additional special forces to puncture Isis’s sense of “invincibility”. “In essence, subjecting them to high profile, humiliating defeats, where we strike them, we capture or kill their leaders, we videotape the operations, we publicise them,” he told ABC.